Hi! My name is Zara Magsi and I am delighted to introduce the Talking Tots program to Pakistan. I received my professional training from the Association Montessori International (AMI), where I was awarded the AMI Montessori Diploma. My journey into professional pre-school teaching began in 2008, and I have since had the pleasure of working at some of Pakistan’s leading pre-schools. When I first read about the Talking Tots program I was intrigued by its unique approach and structure. On learning more about the Talking Tots program it became clear to me that a novel and internationally acclaimed program such as this would be an excellent addition to the pre-school offering in Pakistan. As such, I commenced my formal training in the Talking Tots program in the UK with the lovely co-founders of the program – Lisa and Tracey. Lisa and Tracey deserve special thanks, not only for their excellent and rigorous training, but also for designing certain elements of the Talking Tots program especially for Pakistan. · Sharing and taking turns-helping everyone get along better. I will be delighted to hear from you if you are a parent or a care giver and are interested in having your child develop the skills that will instill the positivity and confidence desirable for the child’s big leap into primary school. Are you looking for a fun party package that promises maximum entertainment with minimum fuss? 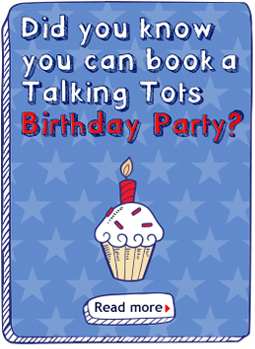 We can provide a personalised Talking Tots party package for birthdays, celebrations, or corporate events, for children aged 5 or under. Nursery rhymes and music to get everyone in the party mood! For further details, please contact your local Talking Tots class leader for prices and availability.